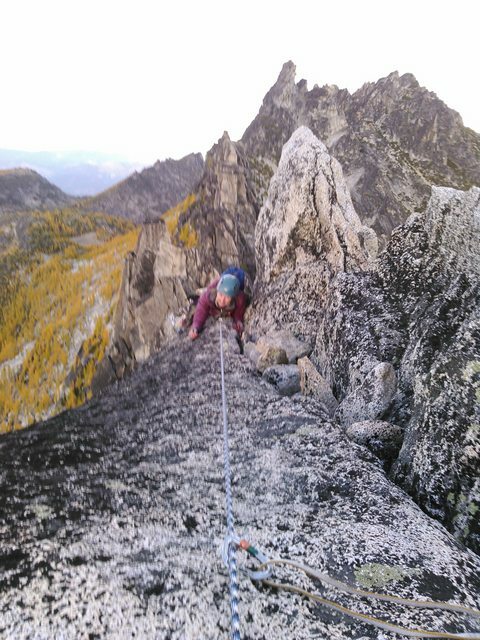 Val and I had been eyeing the Beckey-Davis route on Prusik for a while, and after a couple weather and life related misfires, finally got our chance. We headed up to the trailhead the night before, leaving Seattle at 6:30 and making it to the trailhead a little before 10, even after stopping for groceries and dinner. We got off to an early start the next morning, waking up at 3:45 and heading off around 4:15. Steady hiking took us to the lake, and we steadily climbed up Aasgard as the sun came up. As we crossed the plateau, the day gradually got warmer and less windy and we started to get excited about climbing. We racked up and stashed our packs in a tree, and were ready to climb a bit after 10. 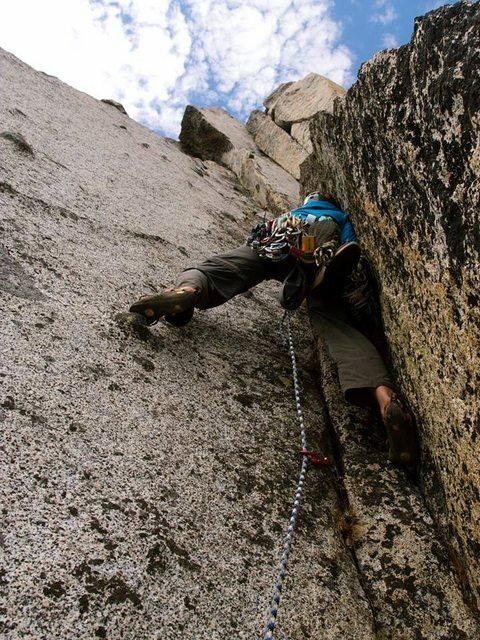 I got the first pitch, and decided to choose the 5.8 crack that is technically part of the Stanley Burgner over the 5.7 “unprotectable” chimney. I was a bit nervous based on the description of the crack as “wide and awkward”, but it protected really well with our rack (I used two threes and a four on the wide part) and succumbed to my remedial off-width technique without any trouble. From there, Val headed out on 5.7 terrain for about 50 meters, then brought me up. I took the next pitch, and it started to seem like we might be off-route as I plowed through piles of lichen. But pro and holds continued to come up, and I worked my way to the base of a clean corner that lead to a ledge system where it looked like we could traverse back right to the crux pitch of our route. Val took over and climbed the awkward corner, and then started the traverse. 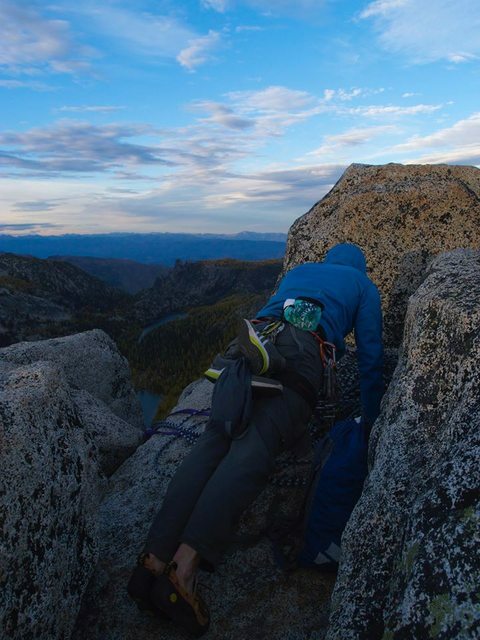 A few short pitches of horrible rope drag took us over the ledges, to the Snafflehound ledge – a large ledge that was perfectly flat and more than large enough for a bivy. We refueled and I racked up to jump onto the crux. The crux pitch, a 5.9 shallow dihedral, started off easy but rapidly got more difficult as the cracks got thinner and dirtier. I cleaned some moss and dirt out of a particularly dirty section to get some pro, then moved up to a good stance just before the crux of the route. A good crack on the right gave me a few good pieces before I moved onto the crux – an eerily thin flake with thin features for feet. 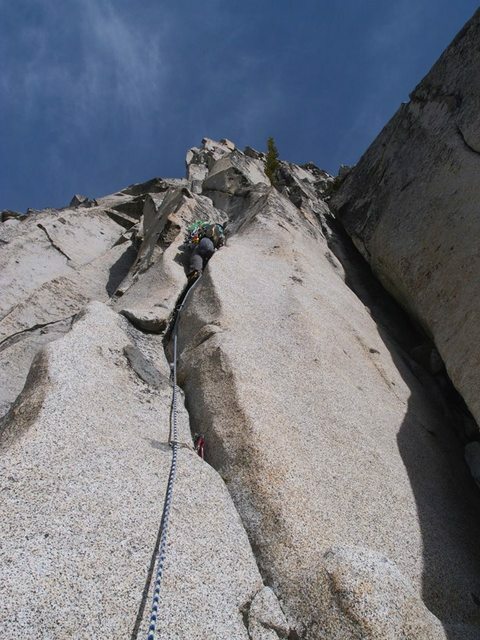 This lead to a large solid undercling flake where I put in a solid cam and pulled an awkward bulge, then the pitch got easy as I went up some friendly twin cracks to the next belay. We were sure we had just climbed the crux pitch, but from our belay there was only one way to go, and it didn’t seem to match the route descriptions we had. But Val was up to the challenge, and squeezed through a narrow gap, then climbed through some awkward 5.8-ish moves before getting to easier ground that lead to the notch right below the summit. 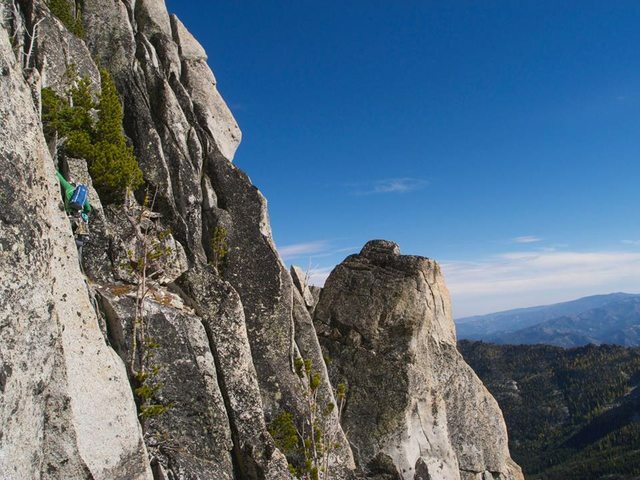 From the notch, there are two choices to get up the last few meters to the summit- a 5.10- tight hands crack that goes straight up, or a traverse to the north that leads to a 5.8 corner. Not excited about the prospect of more awkward 5.8 moves, I stood on my tiptoes to place a cam high in the 5.10 crack and started up. Some good jams took me to the top of the crack. At this point, a cold wind had numbed my hands, and nervous about doing a mantle without having hand feeling, I reached forward, grabbed the best holds I could, and did a fully horizontal beached whale move as Val laughed below. Val followed with even colder hands and an awkward follow pack, but still managed to nail the beached whale move. After topping out, we waited at the summit as an off-route west ridge rope soloist worked his way up the rappel route. Val, who had gotten the worst of the cold wind belaying at the notch, wore both of our puffy coats, while I stayed warm by doing summit pushups. 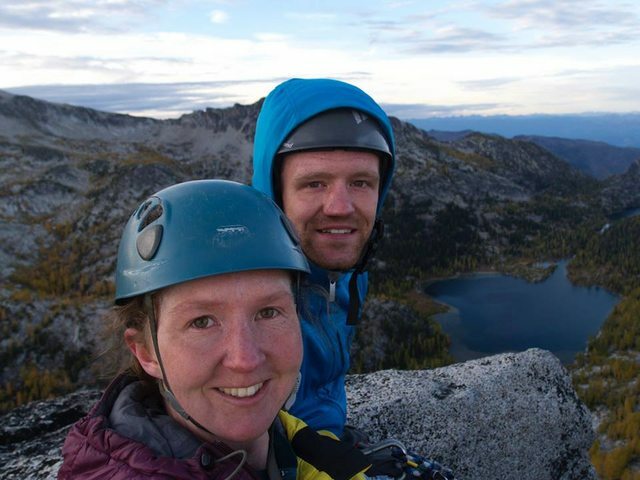 After a short wait, four rappels took us to scrambly terrain on the north side, after which only six hours of walking took us back to our comfy car bivy. Over all, we were glad that we did the route, but would probably recommend the Stanley Burgner above this one – Val, who has done both, described the SB as much cleaner and easier to follow. Gear Notes: Doubles 0.3 to 3”, one 4, silver, blue, and purple TCUs, and triples of 0.75 and 1. All of it got used at some point, and we both felt like it was worth carrying a larger rack in. 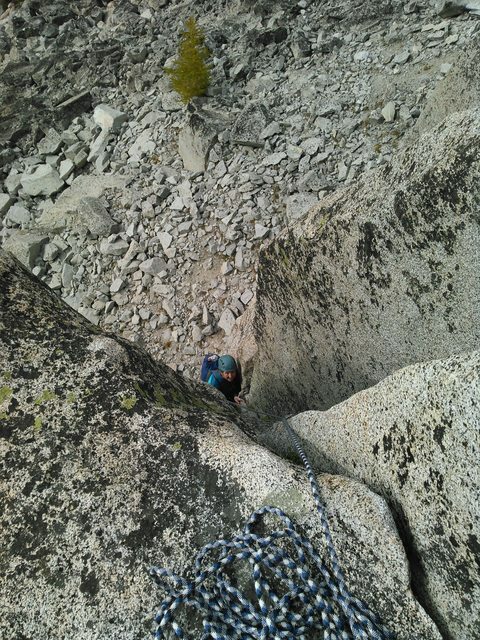 I used almost every piece by the time I built an anchor at the top of the 5.9 crux. Two nut tools – the leader might need one to clean out cracks on the crux. (Most) pictures credit to Val. First pitch. Don’t let the wide scare you, this thing’s a blast. Val following up the first pitch. Splitter up to the summit! The only beta you need to top out on Prusik. 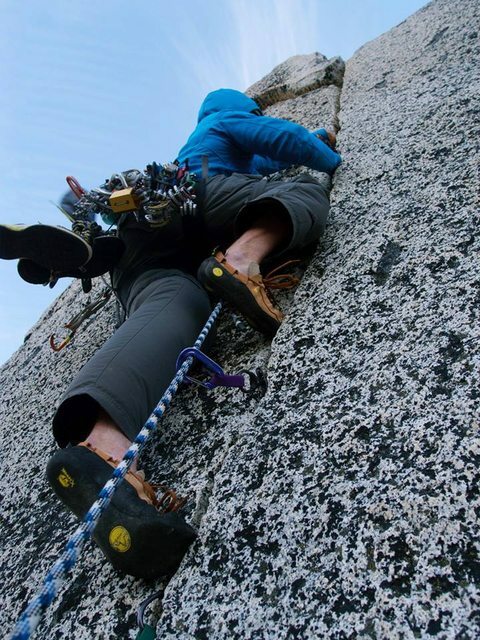 Climbers, remember to exercise your antagonist muscles!